So, another Brownie Doctor! And this time, it's in season! It is a brownie form of the epitome of December and the holidays: peppermint hot chocolate brownies! Spoiler alert: There isn't actually any hot chocolate in these, since hot chocolate is usually too subtle a flavor to really be noticeable. We bring the "hot chocolate" aspect to these brownies via marshmallows. 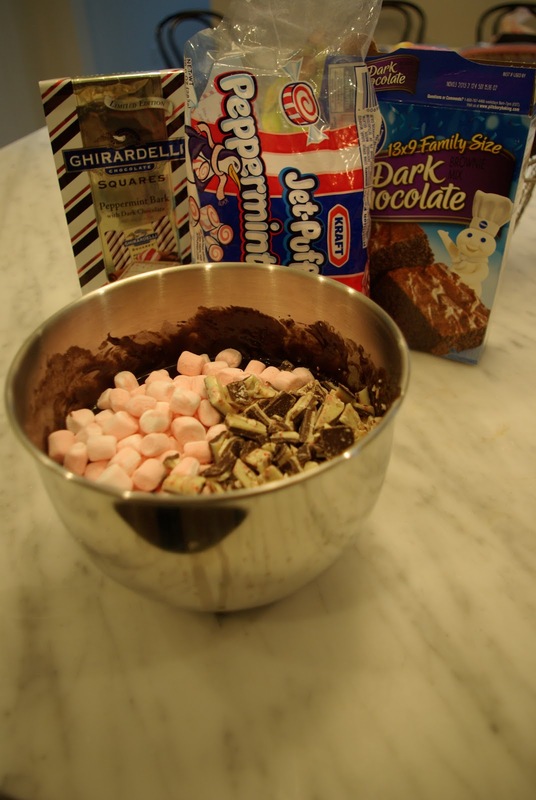 We had a plan for these brownies to just do brownie mix, York pieces and then hu-mongo marshmallows. Fortunately, our plans were postponed due to travel and Thanksgiving, so we were able to go a huge store before making them. That happened to have a WONDERFUL Christmas aisle filled-to-bursting with yummy Christmas things! Let me just say, if I worked there, there would be a significant and mysterious decrease in stock. (Because I would be stealing it as I stock up.) It included some things that I definitely want to get or try sometime, like special seasonal candy cane Andes mints (I already found a recipe to use those). We originally piled a bunch of things into our basket before going through the mom-check and having her veto peppermint frosting, peppermint Andes mints, etc. But we DID end up with Ghirradelli (did I spell that right?...) peppermint bark to replace the york pieces, and mini peppermint marshmallows to use instead of the super-sized ones. A very successful shopping trip. So the actual baking process of these is quick: make the batter, then put in as much of the Ghirradelli bark and marshmallows as you deem necessary. That was how much we deemed necessary. The more crushed chocolate pieces you use, the gooier and mintier your brownies will be! They baked for an unusually long amount of time, so be warned, you may have to put it in longer than the box instructions. I bet the marshmallows had something to do with it. But they tasted quite good! The marshmallows melted and the peppermint bark kind of fused into the brownies, making it taste super peppermint-y and authentic. I recommend it! Then, a while after they were baked, I took pictures of them, and because we had to get them with natural light, I had to lay down on our patio outside (in my shorts and a T-shirt) and photograph these lovely baked goods. Can I just point out what a travesty it is that it's almost December in the midwest and it's warm enough to tolerate going outside in shorts and a t-shirt?? Not. Okay. Where's my snow, Minnesota?! You're not living up to your reputation and, quite frankly, I am disappointed! But I think the pictures turned out pretty nicely, so it's all okay! I had a squirrel scare while I was taking pictures. It was all quiet out there, and then I heard this rustling, and, following natural instinct, scanned the ground for larger predator animals before realizing it might not have been a bear and looked up into the trees and saw some squirrel just bobbing on a branch. They get kind of crazy this time of year. You know, more rash, dashing across the street more in their hunt for nuts. The squirrels on campus are crazy at ALL times of year. They have been too socialized to the presence of students on campus and no longer know their appropriate fear of humans. So, that's three recipes in our book so far! We're on our way to having a full-fledged cookbook. Eventually. In a year. Or two. But you know, I'm just a naturally optimistic person, so let's say by a year. P.S. I thought this was pretty cool: since we were baking together, Molly was doing some baking while I was taking pictures and vice versa. So when she was pouring the batter into the pan, I was taking action shots of it pouring in. And I think they turned out really cool! If you look at them quickly in a row, it looks like the batter is pouring out! Right before your eyes! Kind of! Slow-mo makes anything look epic, even baking! Bake time: I bet you could do this in five minutes. Maybe ten. 1. Preheat oven according to your box directions. 2. Make brownie mix according to your box directions. 3. Mix in the peppermint marshmallows and peppermint bark.